Floriani Embroidery Thread is a high sheen, high tensile strength embroidery thread which results in excellent production and adds magnificent color and luster to your finished products. We offer all 360 threads for your project. A high sheen, high tensile strength, lubricated embroidery thread which results in excellent production and adds magnificent color and luster to your finished products. All phases of the manufacturing process are performed in-house to insure quality. Employees are thoroughly trained on the use of the equipment and internal procedures to maintain high level of quality. Each cone is coded so that a lot number, machine, and operator can be identified if necessary. Each lot of new raw material is inspected and tested to make certain the quality of materials going into production are sufficient for producing a quality product. The same is true for finished products. An internal lab is used to test random samples of raw materials and finished cones, for control reasons. Furthermore, an independent, international testing lab is used to measure the quality of threads with respect to tensile strength and color fastness. 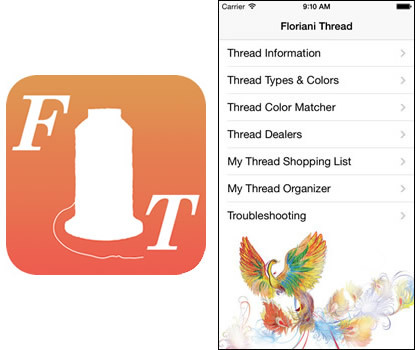 Floriani just released our brand new thread app for the Apple iPhone or iPad and Android decives. The Thread Organizer section lets you put your personal inventory of Floriani thread into the app and if you see you are getting low on a particular color, simply add it to your built in shopping list! Be honest, have you ever gone to your Floriani dealer and picked up “new” colors of threads only to get home and realize you already had them? We all do this! This app will help you get everything organized beautifully and tweak your shopping list. Another amazing feature is our new color matcher. You can pick any thread made by just about any thread company and find its match in Floriani – the color palette slides from side to side with a finger swipe and then you can simply pick the shade you like best – check your inventory to see if you have it or add it to your shopping list – WOW! You’re going to just love this! The app is listed as Floriani Thread in the App Store. I hope you download it soon.